On a recent garden tour of Cornwall, England, I was delighted to visit the glorious Tresco Abbey Garden on Tresco Island, one of the Isles of Scilly. The Isles of Scilly are an archipelago of five inhabited islands and many rock outcroppings located off the southwestern tip of Cornwall. Reaching Abbey Garden was no small task—a meticulously orchestrated journey by rented van, small airplane, airport transport bus, ferry boat and tractor-pulled trolley. The journey was well worth the visit to this amazing tropical garden filled with exotic horticulture. The gardens at Tresco were founded by Augustus Smith, who built a house on a rocky outcrop overlooking the Abbey ruins in 1838. He was a man of independent means and spirit, and the isolation of the island suited his temperment. The remains of the Benedictine priory, built a thousand years earlier, captured his imagination, and he became determined to create a magnificent garden. Thanks to the Gulf Stream, Tresco has a very mild climate, virtually free of frost. It is however extremely windy and subject to Atlantic gales, so a shelter-belt of quick-growing and salt-tolerant trees was imperative. Smith found the best trees for this were from California - Monterey Pines and Cypresses. He also built a granite wall around his garden to protect it from the elements. He began by planting collections of pelargoniums and mesembryanthemums – fifty of each – and later acquired plants from all over the world through his connections with other plant collectors. At his death in 1872, the garden was essentially in the form that you see it in today. The garden has remained in the same family for five generations, and each generation has made its contribution. Augustus’ nephew Thomas Algernon (Dorrien) Smith continued with the garden, as did his son Arthur who collected plants from Australia, New Zealand, South Africa and the Americas. Those contributions include the grevillas, leucanthemums and the many varieties of proteas that we saw in bloom during our visit, as well as huge American agaves, African aloes, and aeoniums native to the Canary Islands. The garden is protected on the north and west sides by Abbey Hill. It is laid out on 17 acres and bisected by the formal Long Walk surrounded by tree ferns and palms which grow lush in the deep soil of that area. Above the Long Walk are two terraces that span the width of the garden. The Top Terrace has the hot dry conditions and free-draining poor soil of South Africa and Australia. It is perfect for many varieties of Protea, Aloe, Cistus, and succulents, and offers beautiful views of the garden and the sea beyond. The Middle Terrace is the heart of the Garden, with fishponds, a summerhouse and the stone Gaia sculpture, all nestled in a botanical paradise. Thousands of colorful plants from all over the world provide a lush backdrop, and even at the winter solstice, there are more than 300 species of plants in bloom. 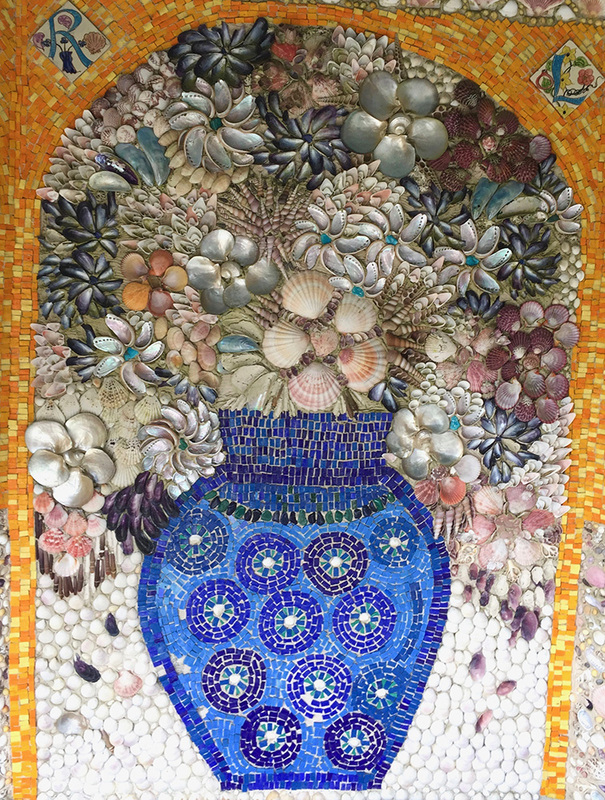 The lowest level is the Mediterranean Garden, with its Agave Fountain and the Shell House decorated with seashell mosaics created by the current owner. Here you will also find the Valhalla Museum started by Augustus Smith which contains a collection of 30 ship figureheads, name-boards and other decorative carvings. Most of the figureheads date from the late 19th century, and come from merchant sailing vessels or early steamships that were wrecked on the Isles of Scilly. I may never see the gardens of Australia, New Zealand and South America, but thanks to a wonderful visit to Tresco Abbey Garden, I feel like I have traveled to many corners of the world and seen the richness of the plant species that they hold. From early childhood, peonies had a special place in my heart. Perhaps it was that their bloom time coincided with my June birthday. Or my mother's often recounted memory of the lavish peony bouquet that Dad had gave her in the early days of their courtship. I loved the soft colors, full blooms and heavenly scent of peony blossoms. Like other June brides, I included peonies in my wedding bouquet, and they were the first perennials that I planted in my garden. 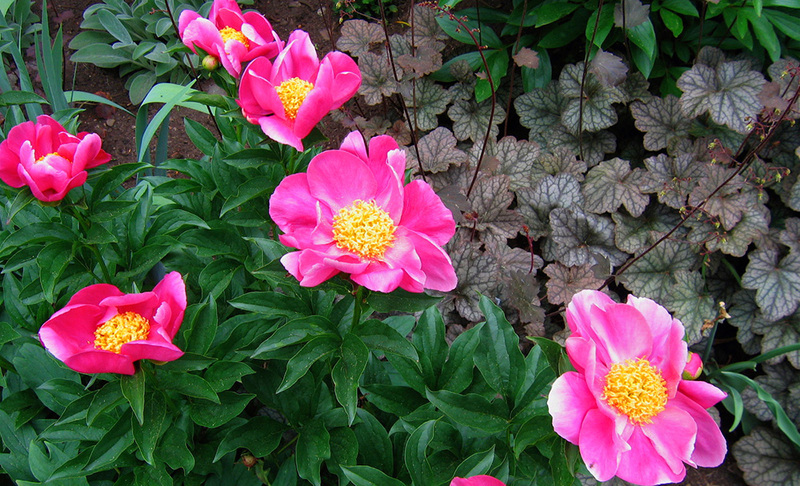 Although gorgeous on their own, peonies can be paired with other perennials and shrubs that will serve as complements or offer contrasts in shape, form or texture. Below are examples of peony partners from my own garden and others that I have toured. Pale pink peonies in my garden are paired with purple heuchera, geranium 'Biokovo' and the colorful foliage of weigela 'My Monet', which is only 2' tall at maturity. The spiky form and soft blue color of catmint complements all types of peonies, as seen at The Mount. 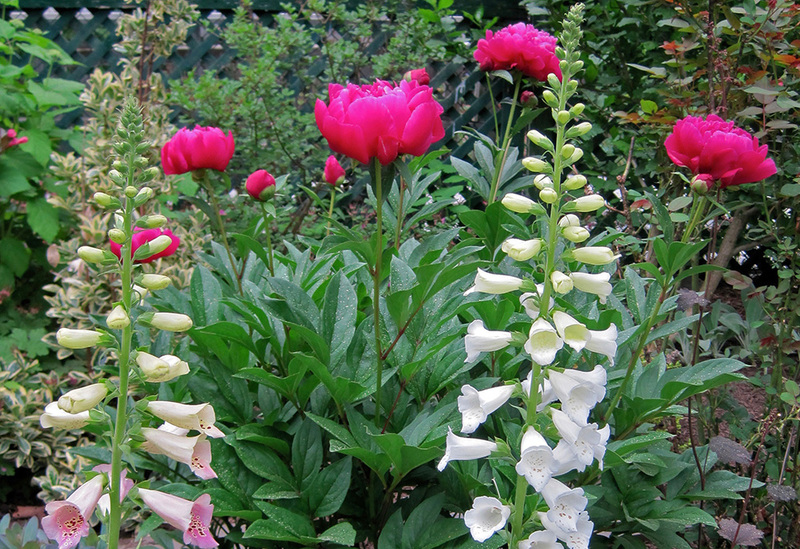 Digitalis offers a strong architectural form that contrasts well with peony flowers. On the Bridge of Flowers in Shelburne Falls, peonies are paired with pale pink poppies and alliums. I enjoy underplanting peonies with purple heucheras and Geranium 'Johnson's Blue'. 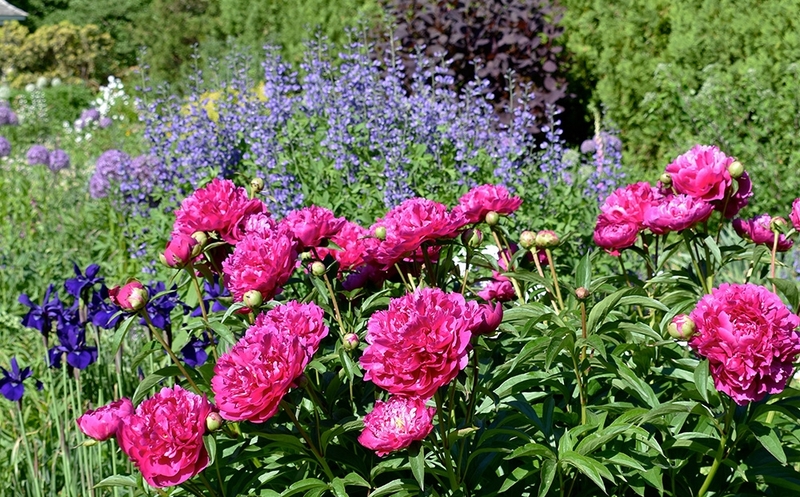 Siberian and bearded irises provide a strong complement to peonies with their large flowers and statuesque form. Baptisia, with its spires of blue, white, purple or yellow flowers, creates a great backdrop for peonies. 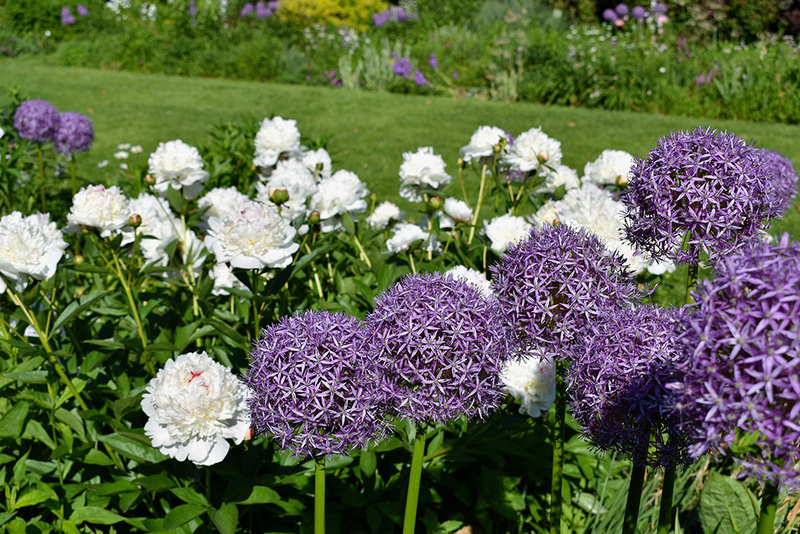 The large flower heads of alliums balance the prominent flowers of double peonies at Ambler Arboretum in Pennsylvania. This lovely combination of coral peonies and purple alliums was a prominent planting feature at Longwood Gardens this spring. Light pink peonies cascade over the fading blooms of hellebores and perennial geraniums. Hellebores thrive in sunny spots as long as they are watered regularly. A boxwood hedge creates a stately and serene background for peonies in a Delaware garden. Shrubs that flower at the same time as peonies, such as mountain laurels (above) and rhododendrons, provide pleasing counterparts. At Winterthur, the peony garden is framed by several old fashioned 'beauty bush' (kolwitzia) shrubs, which can be trained into a tree form or left as a weeping shrub. A gold smoke tree, Cotinus 'Golden Spirit', provides a stunning backdrop for coral peonies at Longwood Gardens. In my garden, weigela 'Wine and Roses' sets off the dark blooms of peony 'Karl Rosenfeld'. 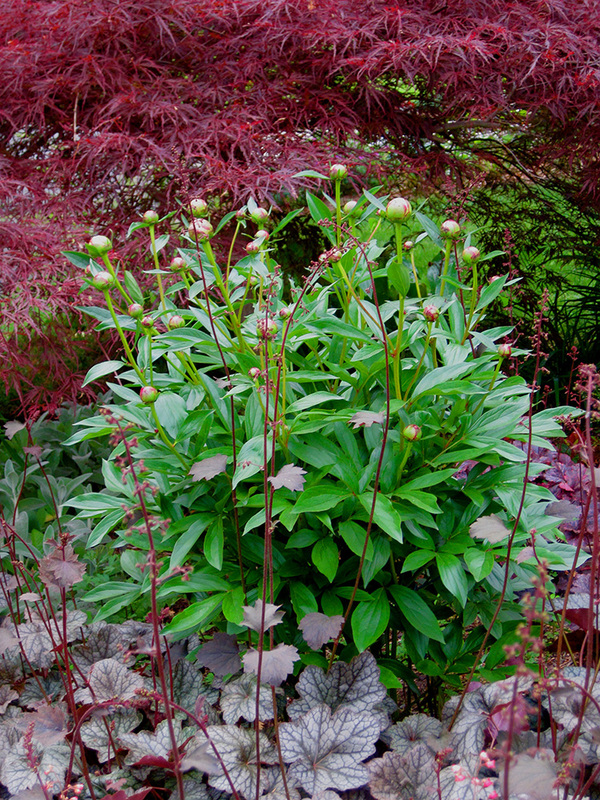 The maroon foliage of a 'Crimson Queen' Japanese maple provides a stunning backdrop to peonies in bud and bloom. In my cutting garden, the peonies are backed by an ivy-covered stone wall that has both aesthetic and functional benefits. It shields the peonies from wind and radiates warmth on cool spring days. I had the pleasure of touring several Hudson River estates after settling my daughter for her senior year at college. One of the places I visited was the Beatrix Farrand Garden at Bellefield in Hyde Park, NY. Beatrix Farrand was one of the first women landscape designers, whose work defined the American taste in gardens through the first half of the 20th century. She championed the use of perennial plants instead of annual bedding, using color harmony, bloom sequence and texture to create beautiful herbaceous borders. Bellefield is one of the earliest examples of her private work - a small walled garden with long flower borders that show single color combinations from pink to blue, purple and white. Seeing the garden in late August, I was struck by the white border, because it showcased a beautiful combination of white phlox and the flowers of Hosta plantaginea. I have many hostas in my own garden, and appreciate them for their strong, lush foliage in a myriad of colors and patterns. But I had never thought of planting hostas en masse, purely for their flowers. There are more than 58 varieties of hostas that have evolved from Hosta plantaginea. They all bloom in August and are prized for their lovely pure white flowers and strong, sweet fragrance. They need ample sun to bloom, and the flowers open in the late afternoon instead of early morning like most hostas. Some of the most well-know culitvars of H. plantaginea are 'Honeybells', 'Aphrodite', 'Cathedral Windows', 'Fragrant Bouquet' and 'Guacamole'. 'Venus', another cultivar of H. plantaginea, has striking flowers that are fully double. Since hostas are members of the Liliacea family, they produce funnel-shaped blooms on scapes that arise from the center of the plant. 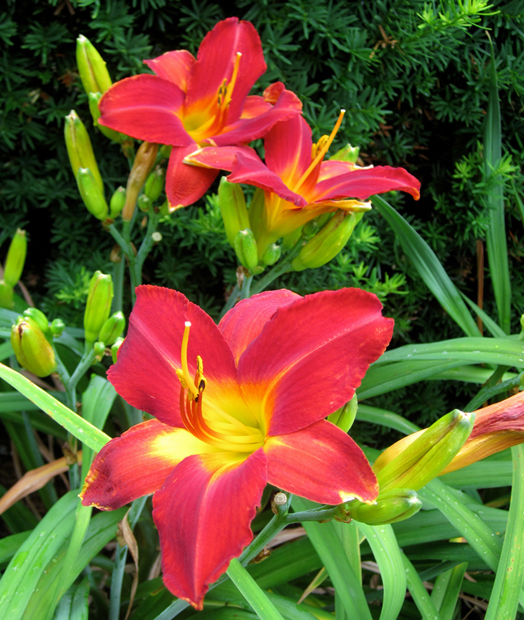 Like day lilies, individual flowers last for only one day. The plant may produce ten or more scapes with up to 50 flowers per stem, so the bloom time can last of 3-4 weeks. By planting different cultivars, you can have hosta flowers in your shade garden from May until frost. Most of us are unimpressed with the lanky scapes and violet blooms of common green hostas. But hosta flowers can range in color from deep purple to white infused with pink. If you look at hosta flowers closely, you may see colorful striations. Others feature unusual flower scape forms, almost resembling scepters, like those of the 'Blue Dolphin' hosta. One of the latest hybridizing trends has been to create branched flowers, as seen in this example created by Tony Avent of Plant Delights nursery. So as you plan future gardens, give some thought to including hostas purely for their floral display. They can make magnificent additions to your landscape! If you are on the Cape this summer, I would highly recommend a visit to Highfield Hall in Falmouth, MA. Highfield Hall and Gardens is the magnificently restored 1878 estate of the Beebe family, with a dramatic history and a vibrant present-day existence. It offers something for everyone – the gardener, history buff, antique collector, art lover, theater fan and nature lover. Highfield Hall was one of the early summer mansions built on the Cape, and is one of the few remaining examples of Stick-style Queen Anne architecture in the Northeast. It was one of two mansions built on nearly 700 acres by the James Beebe family, which gathered on the Cape for the summers and entertained in grand fashion. When the last Beebe family member died, the estate was sold and used for a variety of purposes by subsequent owners – from health resort to religious retreat to hotel. In 1949, the estate was purchased by DeWitt TerHeun, a great patron of the theater and opera, who created a theater on the grounds for college students. The theater remains the home of Falmouth’s much-loved summer stock company from Oberlin College, the College Light Opera Company. From the late 1970s to 1994, Highfield was abandoned and suffered two decades of neglect and vandalishm. In 1994, a demolition permit was filed by the owners, which propelled a group of Falmouth citizens to organize to save the mansion. The group, now the Highfield Hall & Gardens non-profit organization, was embroiled in years of legal battles to stave off demolition. Volunteers cleared the property and secured the building from further decay and vandalism, while raising money and public awareness of the mansion’s plight. Finally, in 2000, the Town of Falmouth took Highfield Hall and 6 acres by eminent domain, and authorized the non-profit grout to renovate and operate the property. The extraordinary restoration effort that followed was made possible through donations totaling in excess of $8.5 million, almost all of which were contributed by private individuals. In 2006, the first stage of restoration was completed, and Highfield was opened to the public. For the garden afficianado, Highfield Hall provides two formal gardens, a labyrinth, as well as walking paths through a rhododendron dell, heritage beech plantings and nearly 400 acres of woodlands. When Highfield Hall was built, there were far fewer trees on the property than there are today, since wood was the main source of building materials and heat. To design their property, the Beebes enlisted renowned landscape designer Ernest Bowditch, and later Frederick Law Olmstead. The Beebes were passionate about their plantings, and many of their favorite beech trees remain on the property. Two formal gardens were part of the original plan. The West Garden, originally a cutting garden, supplied fresh flowers for the house all season long. Franklin Beebe was often found in this garden, tending his favorite flower, the carnation. Today, this garden is planted with shade and sun-loving perennials, from hostas to daylilies, rudbeckia, sedums and scabiosa. The Sunken Garden was restored in 2011 according to a design by noted landscape preservationist Lucinda Brockway. Lucinda based her design on evidence of the Beebe’s original garden, but created a planting scheme that would offer more seasonal color and easier maintenance. The gardens are maintained by volunteers. The central boxwood-bordered beds bloom in shades of purple and blue in the summer with hundreds of salvias, ‘Rosane’ geraniums, and verbena bonariensis, accented with the silver foliage of artemesia, circling spiky yuccas. 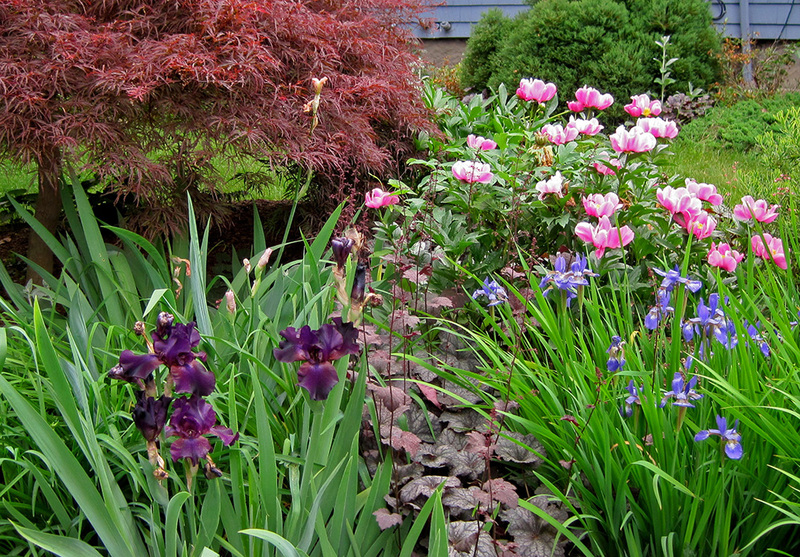 The outer beds feature peonies and re-blooming daylilies. The focal point of the garden is a tall whimsical tree scupture named “The Spirits of the Garden” by Alfred Glover, representing the passageways between the spiritual and the living in the garden. When you visit Highfield Hall the summer, you will be treated to a wonderful art exhibit which is on view through September 14: “Kanreki: A 60 Year Journey. The 60th CWAJ Exhibition of Contemporary Japanese Prints”. This exhibit features more than 200 contemprorary Japanese prints by established and emerging artists. The prints encompass diverse techniques from traditional woodblock to intaglio, lithography, etching, aquatint, silkscreen and more contemporary digital innovations. The show debuted in Tokyo, and Highfield Hall is its exclusive US venue. I recently came across a book in the library called Five-Plant Gardens by Nancy J. Ondra, which features 52 ways to grow a perennial garden with just five plants. I was intrigued by the topic – it reminded me of the “5-Ingredient Recipes” cookbook that my sister-in-law swears by. The book was beautifully designed and illustrated, so I just had to bring it home for a closer look. 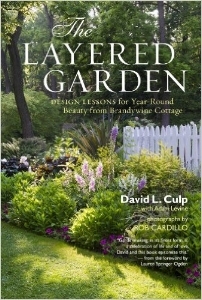 Nancy Ondra wrote this guide to simple gardening primarily for novice gardeners. As she states in her introduction, “..when you’re new to the process, starting with a manageable-sized space, a clear shopping list, and a simple-to-follow planting plan can make the difference between inspiring success and frustrating disappointment.” I think her five-plant strategy is great for gardeners of any experience level, and may even be very beneficial for those seasoned gardeners who are looking to scale back and simplify their complex, time consuming gardens. The “Five-Plant Gardens” concept is a great organizing and editing tool. (And by “gardens”, I mean a garden bed, or a small plot, not the entire property.) After gardening on my own property for 22 years, studying landscape design and visiting hundreds of gardens, I can attest to “less is more.” Less variety and more of each type of plant, that is. Not the collector’s approach of “one of this and one of that”, but large masses of the same plant, which create a stronger statement in the landscape. It can be very hard to do, and requires steely self-control, (not to mention a special “collector’s bed” where you can house your impulse purchases), but the result can be very satisfying. And with a small variety of plants, the maintenance is much easier. I have a “five-plant garden” that I installed 20 years ago, and it still pleases me after all these years. It is a shaded circular bed in the loop of my driveway, with a gazing globe as its focal point. The five perennials are hellebores, astilbes, cinnamon ferns, hostas, and fringed bleeding hearts – low maintenance shade plants that provide four-season interest. Hosta blooms stand out in August, and the changing colors of fall foliage provide interest from September through November. I’m going to break the five-plant rule by adding snowdrops for February appeal. Since they are early bulbs that completely disappear, perhaps they won’t count? "Pots are perhaps the purest expression of planting design. Composing a pot is like a chef creating a salad—all of the rules of design get stripped down to their essence. In a larger landscape, the hand of the designer can be lost, but with a pot, the artificial environment is a pure display of horticultural skill." I saw a fabulous display of this horticultural skill during my recent visit to Longwood Gardens and Chanticleer. Need inspiration for your spring pots? See the beauties below. Pitcher plants and ferns are an unusual choice for this bowl in part-sun! A grand display creates a focal point in a long walkway. Small redbud trees and dark pink foxgloves add drama. A pot of wallflowers and burgundy heuchera is simple yet stunning. a formal urn of purple, orange, chartreuse and silver welcomes visitors. The simple repetition of deep purple-black pansies accentuates the pink and purple tulips. A large pot of edibles and flowers in the courtyard. Blue fescue grass sets off the white poppies in a courtyard of raked sand. The colorful branches of red-twig dogwood 'Midwinter Fire' combine beautifully with orange poppies, bronze fennel and golden creeping jenny. Feel inspired? I sure did! Spring Perennials Dazzle “En Masse”! Like most novice gardeners, I began my gardening hobby by collecting one of every new perennial that I found. I was intrigued by the countless varieties of blossom, leaf shape, size and habit that existed in the plant world, and driven by the “plant lust” that many gardeners share. Weekends were spent digging new garden beds to contain the growing collections. While I enjoyed my new acquisitions, I was never really happy about the way that my garden looked overall. The wide variety of plants looked great in my friends’ small gardens, but somehow did not work in mine. 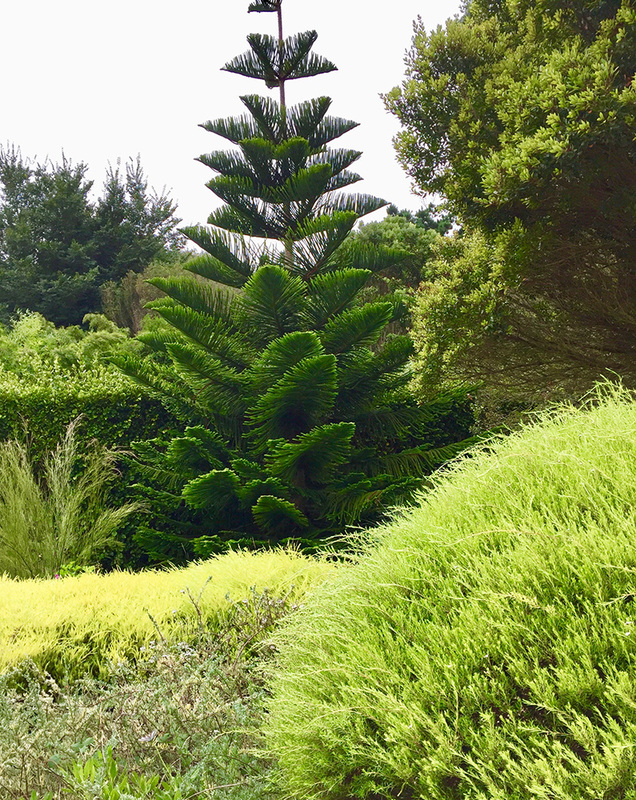 As my garden grew to encompass my one and a half acres, I realized that mass plantings were the missing ingredient in my overall garden design. Visiting other gardens, particularly public gardens, has shown me that massing perennials has terrific impact. If you have a large garden, the plants must be arranged in significant groupings because the garden beds are viewed from a greater distance. Garden books recommend planting perennials of groups of three or more, but in a large garden, that group may be 30 or more for best effect. Now as I tour gardens, I am obsessed with the power of mass plantings. Spring blooming perennials are really well suited for this design technique. Many of them are small plants with delicate flowers that will look lost in a large garden. See how wonderful they look en masse! Entry gardens are a challenge to design because they need to be interesting in all seasons. But they also provide a wonderful opportunity to showcase tiny interesting specimens that would be lost in a distant landscape. We were delighted when our friend Deborah asked for assistance in designing a new entry garden for her suburban home. In addition to new foundation plantings, Deborah needed help with a small entry garden bed that is the focal point of her front yard. The entry bed is a highly visible triangle bordered by the driveway, the walkway to the front door, and a winding brick path that Deborah installed herself. Mounded in the center, it has good drainage and dappled sunlight for most of the day. Deborah likes Asian-inspired gardens, and wanted to incorporate her ‘Crimson Queen’ Japanese maple, creeping phlox, hostas, and an unusual collection of geodes inherited from her grandfather. Above, Deborah’s previous garden had included mostly sun-loving perennials that bloomed briefly and then blended into a mass of green. We wanted to give her garden interest throughout the seasons with fabulous colored foliage, different textures and a variety of plant forms. Because the garden is so highly visible at close range, we came up with the concept of creating a “jewelbox” entry garden – a collection of small specimen plants with intricate details that delight the eye upon close inspection. We decided to incorporate plants that would evoke an Asian garden. We chose a color scheme of yellows and maroons to complement Deborah’s house colors. And we came up with the concept of a large tufa trough that would serve as a focal point for the bed and unite several groupings of geologic specimens. Hypertufa troughs look like stone, but are actually made of peat moss, perlite and Portland cement, so they are much lighter than they appear. Ours is filled with hens and chicks, mini hostas and a miniature carex. Small objects in a garden, like these geodes, are more effective when grouped. Although newly planted, the new garden already has interest from the variety of forms. Our plant palette consists of spiky plants such as daylilies, dwarf iris, and blue fescue; low creeping plants such as sedum ‘Angelina’, creeping wooly thyme and Irish moss; large-leaved plants such as hostas and coral bells; and feathery plants such as Japanese painted fern and miniature conifers. As the plants mature, they will create a complex tapestry of colors and shapes. Shades of maroon from the Japanese maple, red fountain grass, heuchera ‘Stormy Seas’ and the winter color of bergenia complement the home's brick façade and maroon shutters and doors. Glimmers of gold from hosta ‘Great Expectations’, hanoke ‘All Gold’, heucherella ‘Sunspot’, yellow dwarf iris, and ‘Happy Returns’ daylilies echo the creamy yellow siding. Four season interest will begin with miniature conifers and hellebores in winter; snowdrops, mini daffodils, creeping phlox, epimediums and bergenia in spring; alliums, irises, Astilbe ‘Key West’ and daylilies in summer; and hanoke grass, blue fescue, black mondo grass and ground-hugging sedums in fall. Unusual miniatures include alpine lady’s mantle, carex ‘Beatlemania, and mini hostas ‘Stilleto’. 'Kii Hime', 'GinkoCraig', ‘Lakeside Cha Cha Downsized’ and 'Lakeside Baby Face'. The jewelbox garden is grounded by a simple foundation planting of ‘Green Lustre’ hollies, hydrangea ‘Quickfire’ astilbes and epimediums, along with a hosta hedge that was already on the property. Ornamental grasses surround a stone sculpture. On tour through the Garden Conservancy, a stunning private Fairfield County, Conn. garden provided an inspiring lesson in mass planting. Created by AHBL Landscape Architects of Seattle, Wash., the 8-acre garden featured modern sculptures set in oceans of fall blooming perennials and ornamental grasses. Mass plantings of grasses and native perennials have been popularized by Dutch landscape designers such a Piet Oudolf, and have often been displayed in design trend magazines such as Garden Design and Architectural Digest. This was my first time actually walking through such a garden, and I was amazed by its sheer size and impact. Plants were used not in groups of 3 or 5, but in groups of hundreds. The garden was a juxtaposition of strong structure and soft plantings, of modern, geometric beds set against rolling fields and woods. Although I do not usually garden on such a grand scale, this garden was terrific inspiration for creating a “wow factor” with magnificent swaths of plants. There are very few perennials available to us here in New England that offer the color and form of blue hosta. With colors ranging from deep blue to powdery light blue, they offer a quiet presence that can be used almost anywhere in the shade garden. Plants range in size from giant to small and display a variety of forms and leaf shapes. Actually, blue hostas are green hostas with a coating of white wax on the leaf surface, which makes them appear blue. Blue hostas prefer shade: too much sun melts the waxy coating. Like most hosta leaves, they change color throughout the growing season. Blue leaves eventually turn to shades of green. 'Dress Blues' (above) is a medium hosta that forms an upright mound of blue leaves with a yellow margin that lightens to cream as the season progresses. Hosta and ferns make lovely bed-fellows with the delicate fern fronds contrasting and complementing the solid hosta leaves. The dark stems of this fern play off the blue of the hosta leaves, creating subtle harmony.